Here comes another compact mini box mod – this time from team at Smoktech. The Smok R-Steam Box Mod offers up to 80W of output power with temperature control; supporting Ni200, titanium and stainless steel wires down to 0.6 ohms. At just 82 x 38 x 22.3mm, it’s definitely small, but it includes a nicely-sized 0.91 inch bare OLED screen and large square firing button. 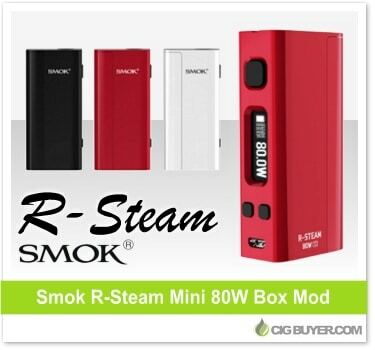 Powered by a single 18650 battery, the R-Steam Mini features magnetic battery door, micro-USB charging, spring-loaded 510 and comes in four attractive colors.